One of the biggest elements of our philosophy is giving back, and as a community-based business, that is always our goal. We use only the highest quality wheat, milled devotedly every morning for the freshest taste. Every loaf and bread in our Newtonville bakery is kneaded with love, baked with care and handed with a smile. It may not change the world overnight, but the devotion and affection put into making the best bread possible, is our way of making a small difference every day, one bread at a time. Think about it, we all have those days where we really need someone or something to make us smile. When you walk into our bakery in Newtonville, MA that is exactly our objective, to make your day. Now, our challenge to you, is to help us do the same for someone else. It really isn´t that hard, and if everyone would do this, the world would really change. So start today, go out of your way to buy your new coworker one of our delicious sandwiches for lunch today. There are many, out of the ordinary moments in life, where a favor or some sort of gift would be ideal to say congratulations, demonstrate our appreciation or show that we truly do care. Doing so with the right gift can be a difficult choice to make. The problem is that either we do not know what they have, don´t have, need or don´t need, or we are unsure of what they might like. Let us reassure you that for all these situations there is a right answer. Great Harvest in Newtonville is always the way to go. In our bakery or online shop you will constantly find the best options for every day treats, and special gifts. For every special occasion or any situation, we offer our hand crafted gifts, original and freshly baked goods. You can choose from a variety of bread baskets and combination of treats from our shop. When it comes to our products you will always find delightful and appetizing, bread, sandwiches and treats that are perfect for all your gift giving needs and events. So jot down our number, save our page and be worry free about what to give. When in doubt, and all the time, count on us to make the right impression. Don´t just give a gift, give the present of a delectable experience. Offer something that is not just given by you with love, but also baked with good sentiment and created with passion. We know all our products and most of our customers very well. That is why we have compiled a few options and ideas for the perfect fusion of goodies that are ideal together. Below we list some of the events or occasions for which they would make a perfect match. Using our expertise, personal knowledge, and customer feedback we created this resource for you. In it, you can find the right products to fit different situation, so that you don´t have to break your head figuring out what the right gift is for each occasion. Having a baby is certainly a super-special and lifechanging event. There are many great gifts for newborn babies from onesies to rattles, but we know from first hand experience, that one of the best gifts for the new moms is food. With the exciting and overwhelming new schedule of a mom, there is very little room for eating, let alone cooking. As a new mom, one of the things that is most appreciated is when people quickly stop by to bring you food. Of course fresh, natural, unprocessed, freshly baked bread and goodies are highly welcomed. For this type of celebrations the best way to say congratulations is with our Friends & Family selection from the Hand Crafted Gift section. It is the perfect basket to give to a new mom, it includes the our exquisite bread, made with ultimate quality whole grains, one of the top super foods for new moms. In families where they already have a child, and a new baby is born bringing a gift for the older child is a great idea. When the new baby arrives the older sibling may sometimes feel awkward with all the commotion of the new baby, something that really helps the situation is when people bring gifts for the older sibling as well. A non expensive but very kind way to do this for a child, is to bring a sweet and savory Bready Bear along with the bread basket for mom. It will certainly make the new big brother/sister, feel acknowledged and appreciated. One of the best and major events in life is buying a house or moving to a new neighborhood. These situations can be a new and great adventure, but are also very exhausting and hectic changes. That is why it is such a great idea to stop by the house of a new neighbor with a housewarming gift, or drop off a bread basket at the new house your friend just bought. Our selection of bread baskets and handcrafted gifts are the optimal way to offer a housewarming token for someone that just moved. Our Deluxe Gift Box is the right combination of bread, soup, oil, and jam wrapped in the perfect package to welcome a family to their new home. 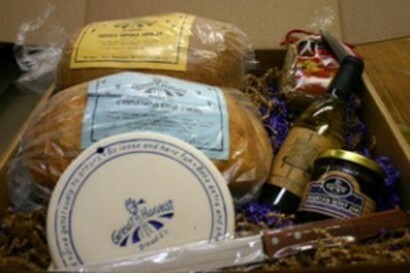 Giving bread as a house warming gift is a traditional symbol of wishing a family abundance of food and blessings. This tradition may have started in native Europe hundreds of years ago. We aren´t sure exactly as to where it originated, but what we are sure of, is that it is the perfect way to wish a family blessings, and bring them a tasty treat. Everyone likes to feel appreciated, and giving someone a savory gift is an excellent way to recognize them. Whether it is a teacher, a parent, a friend or a coworker, demonstrate your gratitude with our Jam and Bread Box. It is a delectable selection of bread of the day, giant cookies and exquisite jam. Don´t let your thanks go unsaid, in the best way possible. Think about all the people in your life that you are glad are there, pick one, or a few, to tell them how happy you are to know them, and send them this box today. When you don´t feel so good, few things can top the nice gesture of receiving some homemade bread and a chicken soup from a friend. For those days when someone you know does not feel their best, or when they are recovering from a cold, send them our Get Well Box. This box is the perfect blend of products for a sick day, with chicken noodle soup, a loaf of honey whole wheat and lemon whipped honey, you will definitely lift their spirits as soon as they see it, and even more when they taste it. No matter how bad they feel, it will surely bring a smile to their face. Call Us to Find Out What's Baking at Great Harvest Newtonville Store Today! Real, natural, whole grain bread, like the one we make everyday is one of the best feel good foods out there. It is actually proven that it can improve your emotions, because its high quality complex carbs increase the levels of neurotransmitters in charge of repairing painful emotions and bad moods. 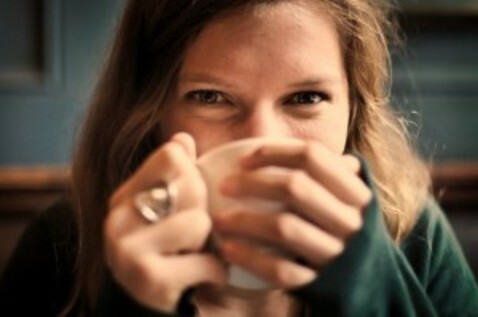 It is also great for curbing unhealthy cravings towards junk food. That makes it an ideal food for any day as well as for special occasions. We Cater in Newtonville, MA! We want to help you bring out the best in any occasion, by bring that wholesome goodness to the table. That is why we also offer catering in Newtonville, MA for any of your events. From an important business meeting to a simple wedding rehearsal lunch, to your exciting first baby shower. No matter how big or how small your event, we are there for you in all of life's celebrations and situations. When you share one of our sandwiches with a friend, give one of our breads to a colleague, or purchase one of our loafs for your family, you are sharing a bit of that care, giving a bit of that smile, and serving that piece of love to those around you. Its not just about incredible bread, its about genuine affection. That is why, when it comes to giving something that shows you care, you will never go wrong with our bread. Our mouth watering selection of unprocessed natural goodness is truly unique, and unbeatable. Contact us now, we are always happy to hear from you, or call us 617-928-1162. Cheer some one up today or get yourself a well deserved treat. 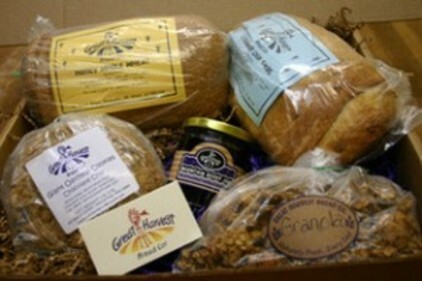 Order your bread box immediately in our online shop, or come to our bakery in Newtonville today, let us make your day.